MIX cracker crumbs and butter; press onto bottoms of 4 (9-inch) springform pans, adding 11 oz. crumb mixture to each pan. BAKE in 325ºF standard oven 10 min. Cool. COMBINE 12 oz. 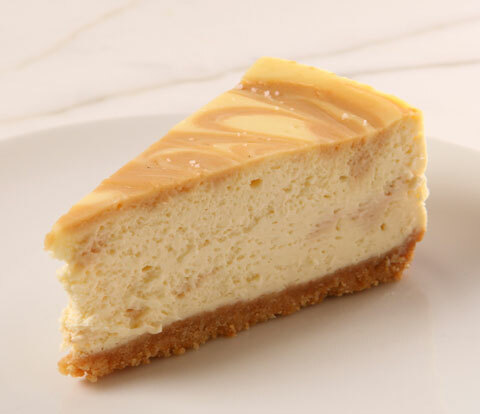 of the cheesecake batter and caramel sauce. Pour 1 lb. 6 oz. of the remaining plain cheesecake batter over each crust. SPOON 3.5 oz. of the caramel batter into pastry tube fitted with 1/4-inch tip; use to squeeze small circles of caramel batter over plain batter in 1 pan; swirl gently with knife. BAKE 1 hour 30 min. to 1 hour 45 min. or until centers are almost set; cool completely. Refrigerate several hours or overnight.